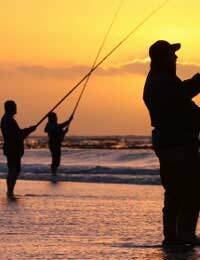 Fishing from the beach – especially when it’s an attractive one – has an appeal all of its own and it can often be the thing which first lures newcomers to the whole business of sea angling. It demands a particular set of skills, and involves one or two specialities all of its own – most notably the long-distance cast – but with a little practice, sufficient mastery can soon be achieved to start enjoying the excellent sporting opportunities to be had beside the surf. When it comes to fishing from the beach, as usual nothing beats a good bit of prior knowledge of the local conditions – and a great way to start is to do some scouting around at low tide. For obvious reasons, catching fish principally hinges on their feeding behaviour, so look for their feeding grounds. Depending on the beach itself, that could be an outcrop of weed covered rocks, dips and gullies in the rocks that form rock pools when the tide is out, patches of sand in otherwise rocky areas and so on – anywhere that small creatures might naturally hide. Keep an eye out also for any obvious food supplies, such as colonies of shellfish, lugworm burrows or signs of rag-worms and make a note of their location. The fish will already be well aware of them, which obviously could make this a productive spot for you to put your hook when the sea returns. It’s also worth looking out for any breakwaters, outfalls of other structures are that are normally under water at high tide; these too may be useful places to try later. If the coastline allows you to get a good vantage point above the beach, it is a good idea to try to get the view from here too – and best of all on a clear, sunny day – with an eye to finding out about the bottom a little further out to sea. With a little practise, the clues are all there. Light blue-green water indicates a shallow area, while a dark blue colour shows where it’s deeper; underwater rocks show up as dark shadows, and sand spits and expanses of mud amongst the shale can all be seen more easily from above. Jot down the locations of all the potentially important underwater features during your reconnoitre and you’ll be well prepared come the day. Traditionally, the hours around dusk and dawn tend to be thought of as the best times to try, especially if this coincides with high or rising tides, but it’s not a hard-and-fast rule by any means. Fish can be taken at any hour, particularly on quiet and secluded beaches and so it’s well worth avoiding “popular” beaches in the summer, even if there does seem to be plenty of room. On sunny days with hordes of joyfully squealing holiday-makers splashing about in the surf, no self-respecting fish is going to venture inshore in search of a meal, no matter how hungry it might be! Fishing in the days after a storm can often be a worthwhile experience, particularly around either of the equinoxial spring tides, since the combination of high water and a churned up sea-bed can encourage fish to come much closer to shore in search of the uncovered food. Where the little fish go, the big fish follow – and that can bring some real monsters within range! The type of fish you’re likely to encounter depends on the time of year and to some extent on the nature of the sea floor. The likes of bass, cod, mackerel, whiting and various of the dogfish are to be found around any kind of beach, while dab, mullet, sole and turbot prefer sand and bream, pollack, pouting and wrasse are to be found on rocky shores. That said, it can still be a bit of a lottery – so a few surprises are only to be expected, from time to time! A good quality beach caster rod around 12 ft in length is ideal for this kind of fishing and should enable you to get your hook where you want it with a little practice. Given the heavy pounding that lines take both in the sea and during the act of casting, although something around 20lbs breaking-strain is a perfect all-rounder for the beach, a good leader line is essential between the main line and the bait. As a general guide, about 20 to 25 feet of roughly double the breaking-strain should be about right – but make sure you tie it on properly! Although the cast is undoubtedly a big feature of this kind of fishing, don’t get too hung up on distance. Flounder can often be found just a few feet from the water’s edge, while bass of very respectable proportions may be lurking only two or three breakers out, so varying your casting distances if the fish aren’t biting can make all the difference. Like so much of angling, it’s all about knowing what’s going on and reacting to it and remember, you can always get a spot of expert local advice from the real professionals – the gulls, herons and cormorants. They always know where the fish are, so if all else fails, watch the birdie and you’ll not go far wrong!